While much trumpeting has been done about the smartphone, physical medicine encompasses much more than science. The art — the psychosocial aspects — of medicine can also be improved by mobile technologies. In fact, mental health applications comprised a significant portion of the Health 2.0 2012 conference’s showcase of next-generation products. Depression, anxiety, and other psychiatric diagnoses are the next set of large problems that mobile health can tackle as they affect patients’ day-to-day lives. For instance, [f] the United States government is already attempting to do this with applications like T2 Mood Tracker and the VA’s PTSD Coach. 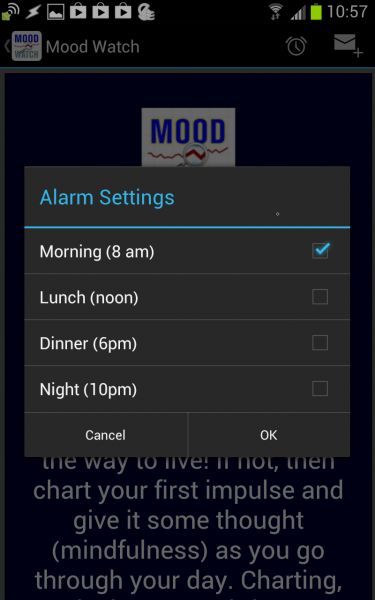 Mood Tracker is an application designed by a bipolar patient. It was recently released onto the Google Play Store and Apple’s App Store. For those in primary care, pain management, and psychiatry who manage their patients’ psychiatric medications, this $0.99 interactive diary may be useful to get a gestalt of their symptoms. The symptoms themselves aren’t fully customizable. Users are assigned a fixed number of categories that are redundant (e.g. anxiety and calm) but whose qualitative scales can’t be customized. 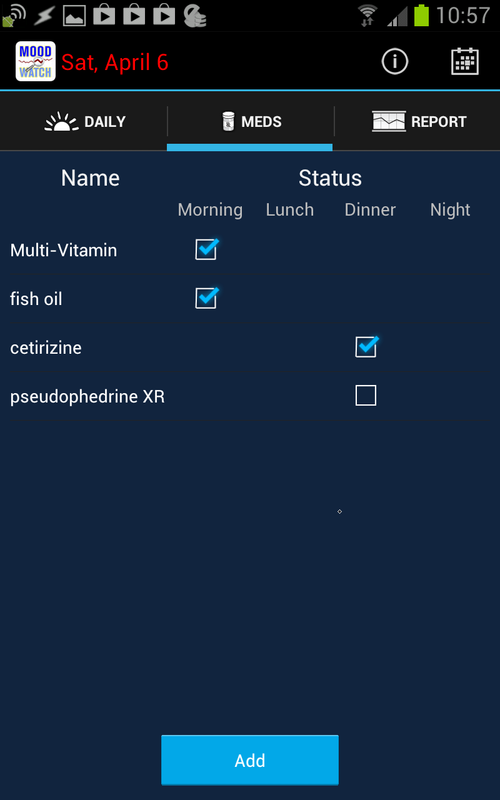 As a clinician, the app fails to capture symptoms I’d be interested in for my patients. For starters, the “quality of sleep” is too general. As can be seen from above, maybe there are nightmares. If so, how many are there? Is the patient having problems with sleep-onset insomnia or sleep-maintenance insomnia? Perhaps they are depressed and have early morning awakenings. It’s hard to tell from this measure. The application is filled with numerous user interface glitches. Besides making it cumbersome to switch dates, it will refuse to let you go back to add or modify the prior day’s entries (should you forget a day). Plus, the Instruction screen uses a large, obnoxious typeface. Are you a night owl? You are out of luck. 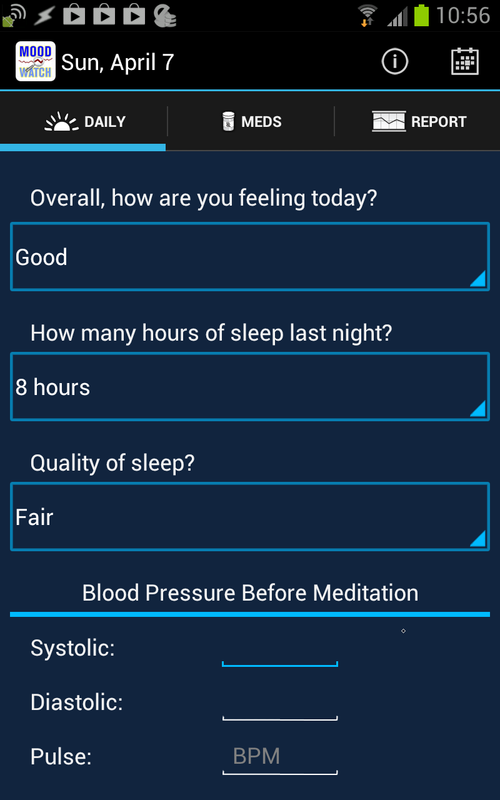 [h] The alarm and data intervals are set at fixed times, only letting you record your symptoms and thoughts for 8am, noon, 6pm, and 10pm. The application allows you to do this, but there doesn’t seem to be a way to track different dosages, frequencies, and formulations of medications on the input screen. Trending the symptoms, along with dosage changes, would be useful for clinicians who are still adjusting a patient’s medications. One strength of the application is the Report view. You can view a beautiful chart on your screen, or e-mail it through a plain text file or a PDF file. Interestingly, you can share the file created, which makes this useful for saving it to cloud services like Evernote or Dropbox, or even uploading it to your clinician’s secure website. The user interface for viewing the reports is a little odd: users can’t zoom in or zoom out to see general high-level trends, nor can they highlight a particular area of the graph to view more details. To view these in conjunction with the medication entries, users have to view the PDF files. Another problem with exporting: its human-readable plain text isn’t immediately usable or importable into spreadsheet or data-crunching programs as it doesn’t bother using CSV or tab-separated values. These citations monitor symptoms with less frequency than this app’s four-times-a-day alarms. After digging through the developer’s website, I finally found their explanation of how this came to be developed at the indiegogo website. In an inpatient psychiatric facility such a product like this might be useful. Patients with primary mood disorders in an outpatient setting, however, likely won’t experience such extreme hour-to-hour variability in symptoms — unless they are developing full-blown mania. Anxiety disorders and personality disorders, perhaps, would experience great amounts of such fluctuations. But even so, this application only pidgeonholes symptoms into fixed morning, noon, and evening categories. 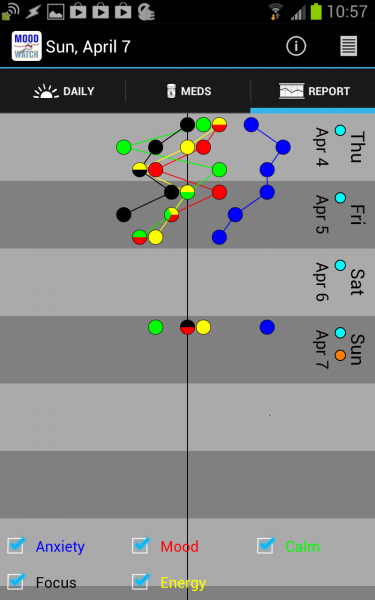 The app doesn’t take into account shift workers or night owls’ schedules, nor triggers (e.g. in the case of panic disorder or PTSD). 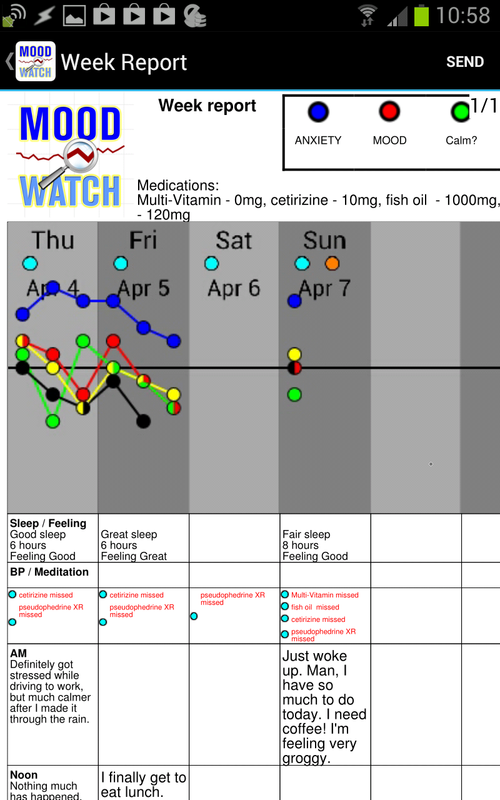 While this is a great start for a mood-tracking application, it does not cover the complexity and variability of mood disorders. 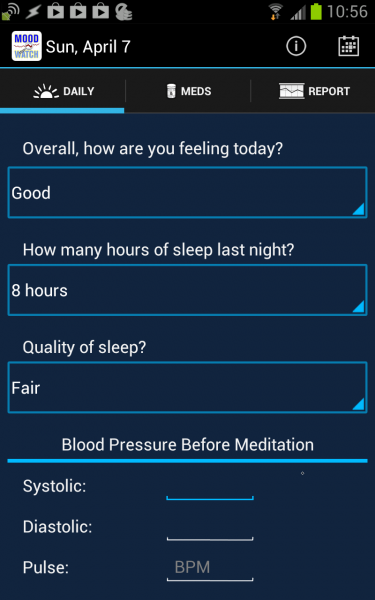 A customized spreadsheet, OfficeSuite, and the Android alarm clock app may be more useful for clinicians to provide to patients at this point. 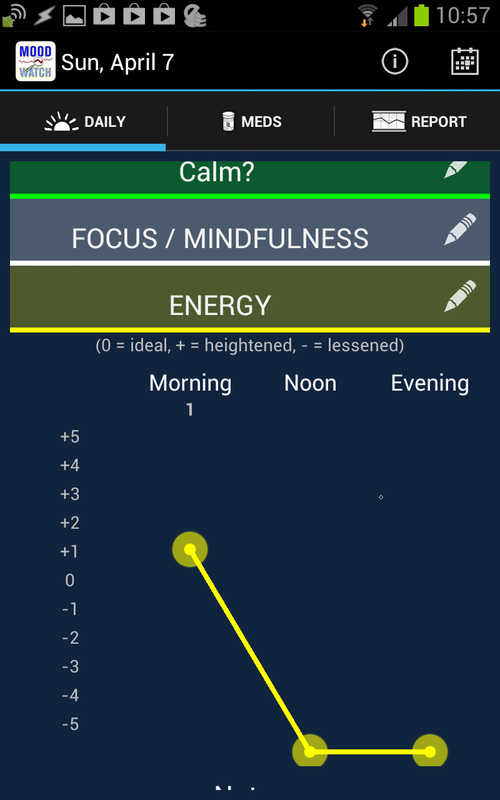 For a similar (and less expensive) tool, check out T2 Mood Tracker, which has similar functionality but also falls somewhat short in areas like sleep symptom tracking. Hello, and nice article. I’m sorry some things aren’t immediately clear… there is a CSV file that can be downloaded into a spreadsheet. The mood components can be customized, and there is indeed a way to go back a day–just click on the date. I didn’t make it easy because the potential for messing up data is rather frightful, so you must choose, screen-to-screen to go back in time. For zooming in, there is a pinch-screen function. As far as not being specific (“quality of sleep”), that was quite intentional. I won’t address the other small details unless questions warrant it. Good article. I am just happy to be helping so many people.